© Troy White 1997 SOLD. 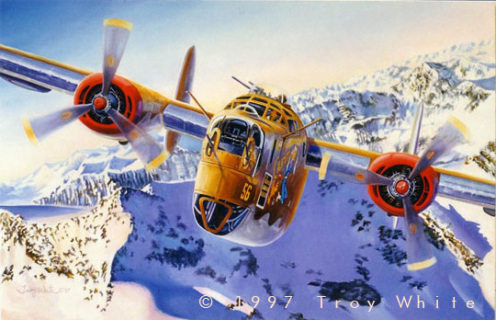 With Lt. Frank McQuaid at the controls, "Calamity Jane" a 15th Air Force B-24H with the 725th BS, 451st BG, makes her way over the Alps on the way back to base at Castelluccio Airfield in Italy. The Consolidated B-24 Liberator saw combat in every theatre during WWII and was produced in larger numbers than any other combat aircraft. 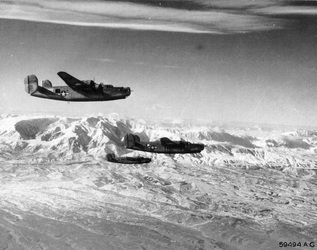 The Liberator could carry more bombs and had greater range than its more popular contemporary, the B-17. 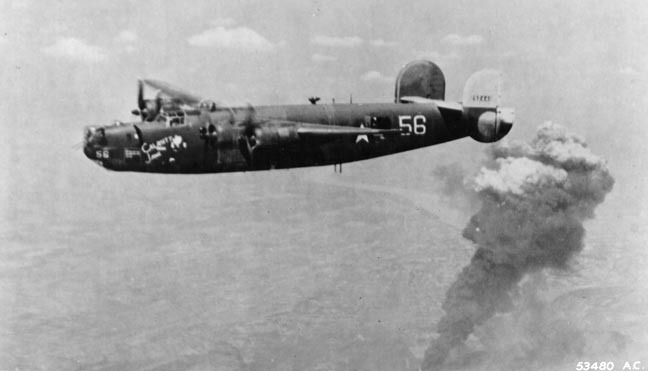 The greater range of the B-24 made it ideal for operations in the Pacific and Mediterranean theatres. Lt. Frank McQuaid was the first commander of "Calamity Jane". McQuaid enlisted in the army in November 1942 and was awarded his wings and commissioned as a 2nd Lt on 29 July 1943. He flew his first mission on 2 May 1944 and by 26 July had completed 33 combat missions against some of the toughest targets in Europe a total of 235:25 combat hours. McQuaid went on to fly 50 missions and was awarded the Distinguished Flying Cross and the Air Medal with two bronze clusters. The official citation for McQuaid's DFC reads in part; "Although regularly and frequently opposed by large numbers of enemy fighters, together with intense and accurate anti-aircraft fire, during which...aircraft was seriously damaged...has fought through to targets and aided in the destruction of vital objectives." One incident in which Lt. McQuaid displayed his professionalism and cool under pressure occurred on 7 July 1944. "Calamity Jane" was coming back from the from a bombing raid on the Blechhammer Oil Refinery in Germany when she ran out of fuel. Lt. McQuaid found himself at 1,000 feet, a mile out from the runway with no power. He calmly declared an emergency and told the tower he needed to make a straight in approach. While the tower cleared the the pattern, Frank ordered his crew to take up their crash positions. He then proceeded to deadstick the big bomber onto the runway between two B-24s which had already touched down! 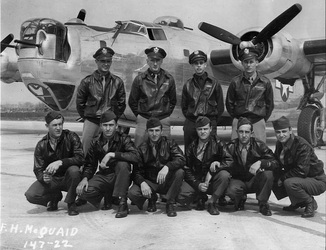 After Lt. McQuaid and his crew completed their missions. "Calamity Jane" continued to fly with the 725th until her luck ran out and she was destroyed on 7 February 1945 in a collision over Vienna Austria. Here is the eyewitness account of her demise.
" I, Albert D. Sherman Jr., 0-828558, was the pilot of a B-24 Liberator Aircraft which flew in the fourth position of the formation on 7 February 1945 with B-24 Liberator Aircraft number 42-52036 piloted by 2nd Lt Darrell M. Burk, 0-2058978, flying number 5 position, and number B-24 Liberator Aircraft number 42-4252440, piloted by 2nd Lt Paul D. Holst, 0-721758, flying number six position. While over the target Lt. Holst received a direct flak hit in the bomb bay of his ship, causing it to burst into flames. He rallied right and in doing so crashed into Lt. Burk's Aircraft. It appeared as if Lt Burk tried to avoid a collision, but to no avail. When the ships collided a few bombs were dropped from Lt Burk's ship. After the collision the two ships remained together until Lt Burk's ship barrel-rolled earthward out of my view and Lt Holst's ship disintegrated". 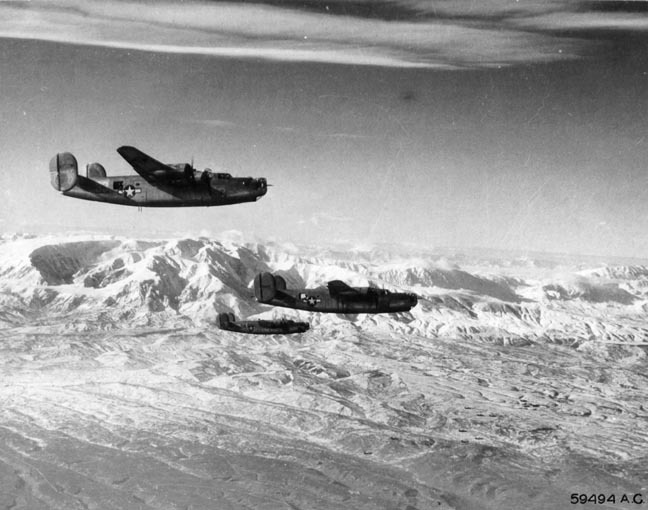 Of the 20 men on board the two Liberators, all perished save two men, one from each plane survived to be taken prisoner.